Twenty-seven University of Notre Dame students were awarded Fulbright grants in the 2016-17 program, placing the University among the top-producing universities in the nation. These 27 students are currently working on their Fulbright projects abroad. Preliminary results for the 51 students who are semifinalists in the 2017-18 competition will be available by May. The Fulbright program is the U.S. government’s flagship international educational exchange program. It awards a one-year postgraduate fellowship for research, study or teaching English abroad. During their fellowship, scholars will work, live and learn in their host country. The Fulbright U.S. Student Program Top Producing list appears in the Tuesday (Feb. 21) edition of The Chronicle of Higher Education. 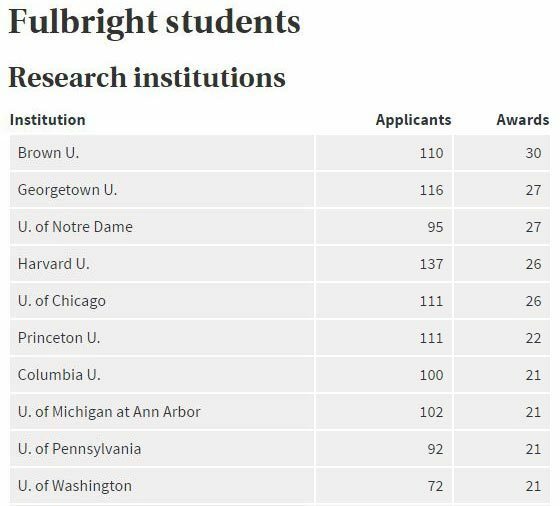 Notre Dame was tied with Georgetown University in second place on the doctoral institution list, trailing only Brown University. This is the first time Notre Dame has appeared on the list for three consecutive years, and this is the University’s highest ranking. Lauren Antosz, Chicago; Spanish, Class of 2016 — study and research grant to Chile. Elizabeth Baker, Wheaton, Illinois; history graduate student — study and research grant to India. Whitney Bellant, Rosemount, Minnesota; psychology and German, Class of 2016 — English teaching assistantship to Germany. Catherine Brix, Ankeny, Iowa; literature graduate student — study and research grant to Chile. Andrea Castonguay, Chicago; history graduate student — study and research grant to Morocco. Genevieve Crum, Louisville, Kentucky; Engineering, Science and Technology Entrepreneurship Excellence Master’s Program Class of 2016 — study and research grant to Italy. Raymond Drause, Simpsonville, South Carolina; history graduate student — study and research grant to Russia. Prinz Jeremy Dela Cruz, Sacramento, California; French and philosophy, Class of 2015 — English teaching assistantship to Andorra. Rose Doerfler, Pittsburgh, Pennsylvania; Chinese and chemical engineering, Class of 2016 — study and research grant to Taiwan. Charlie Ducey, Portland, Oregon; English, theology and German, Class of 2016 — study and research grant to Germany. Aletha Duchene, Northfield, Minnesota; Alliance for Catholic Education Class of 2016 — English teaching assistantship to Brazil. Garrett Fontenot, Lake Charles, Louisiana; history graduate student — study and research grant to Canada. Bridget Galassini, Northbrook, Illinois; international economics, peace studies and journalism, ethics and democracy, Class of 2016 — English teaching assistantship to Spain. Adam Henderson, Cary, North Carolina; political science, Class of 2016 — English teaching assistantship to Malaysia. McKenzie Hightower, Fort Worth, Texas; film and creative writing, Class of 2016 — English teaching assistantship to Poland. Zachary Horne, Plano, Texas; finance and Korean, Class of 2016 — English teaching assistantship to South Korea. Savannah Kounelis, Mattawan, Michigan; neuroscience and behavior, Class of 2016 — study and research grant to Belgium. Kirsten Kozlovsky, Sunnyvale, California; mechanical engineering graduate student, — study and research grant to New Zealand. Angela Lederach, El Carmen de Bolivar, Colombia; peace studies and anthropology graduate student — study and research grant to Colombia. Joseph Massad, Oakdale, Connecticut; political science and Arabic, Class of 2013 — English teaching assistantship to Bahrain. Emily Migliore, Granger, Indiana; political science, peace studies and poverty studies, Class of 2016 — English teaching assistantship to Mexico. Sean Sapp, Vestavia, Alabama; history graduate student — study and research grant to Belgium. Brandon Sepulvado, Calhoun, Louisiana; sociology graduate student — study and research grant to France. Christopher Shuck, Glassport, Pennsylvania; chemical engineering graduate student — study and research grant to Russia. Luke Wajrowski, Crystal Lake, Illinois; philosophy, psychology and Medieval studies Class of 2016 — English teaching assistantship to Argentina. Kyle Witzigman, Springdale, Arkansas; political science and Middle Eastern studies, Class of 2016 — English teaching assistantship to Vietnam. Danae Yankoski, South Bend, Indiana; history graduate student — study and research grant to Canada. The Flatley Center for Undergraduate Scholarly Engagement provides undergraduates opportunities for research, scholarship and creative projects. More information on CUSE is available at cuse.nd.edu. More information about applying for the Fulbright through CUSE is available at cuse.nd.edu/fulbright. Graduate students interested in applying for a Fulbright grant should contact the Graduate School’s Office of Grants and Fellowships at http://graduateschool.nd.edu/professional_development/research/. Originally published by William G. Gilroy at news.nd.edu on February 21, 2017.